Tro (Trasdamad Ganayan) was a freedom fighter, a military leader of the first Republic of Armenia, and a political activist in the Diaspora. He was born in the town of Igdir, in the province of Surmalu (Eastern Armenia , then part of the Russian Empire). His father sent him to the parish school, but the young Trasdamad did not show any interest in books. He would skip school and wander about near the military headquarters of Igdir; his interest in military art developed from these youthful wanderings. He did not do much better in high school in Yerevan. His enthusiasm for the feats of freedom fighters (fedayees) and his interest in the national ideas of the Armenian Revolutionary Federation (A.R.F.) prompted him to create a secret youth movement at school. He became a member of the A.R.F. at a very young age. The Russian government issued a decree on June 12, 1903, to confiscate the properties of the Armenian Church. This created a widespread feeling of ire among the Armenian of the Russian Empire. The A.R.F. created armed groups that acted as guardians of the church property and organized massive demonstrations. Tro Ganayan joined these groups. He later engaged in the clandestine transportation of weapons from Surmalu to Western Armenia. In 1905 he participated actively in the Armenian self-defense against the Tatar attacks in Baku and other cities of the Caucasus. 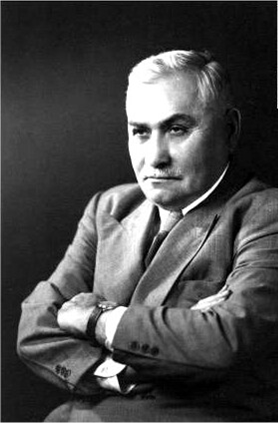 Following the decision of the party, 21-year-old Tro killed Prince M. A. Nakashidze, governor of Baku, regarded as the main driving force behind the massacres of Armenians. Tro was also active in many battles in the regions of Nakhichevan and Zangezur, and distinguished himself with his talent as a military organizer and strategist. Tro moved to Tiflis during World War I and became commander of the second battalion of Armenian volunteers, which advanced in the direction of Igdir-Bayazet-Berkri-Van. He was gravely wounded in battle. After recovery in Tiflis, he returned to the command of his troops and entered Van. Three years later, in March 1918, the Armenian National Council of Tiflis, the supreme authority of Caucasian Armenians, designated him military commissar of the Armenian army corpus. In this capacity, he led the Armenian army in the battle of Bash-Aparan from May 23-27, 1918, which became one of the decisive battles that achieved the independence of Armenia. In the years of the Republic, Tro was among the organizers of the Armenian army, and he also was charged with the maintenance of political stability in the country. He fought victoriously in the brief Armeno-Georgian war, and then in Zangezur and Karabagh against the Azerbaijani encroachment in late 1919 and early 1920. He became Minister of Defense in the short-lived cabinet of Simon Vratzian, who was prime minister between November 24 and December 2, 1920. The catastrophic situation of Armenia, defeated in the Armeno-Turkish war started in September, and on the verge of being overrun by the invading Turkish army, prompted Tro to adopt a pro-Russian position. He found that the only alternative, as the lesser of two evils, was the establishment of the Soviet regime in Armenia, which would guarantee the survival of the country. By an agreement signed on December 2, the government of the Republic of Armenia resigned and transferred power to the Communists. Tro and a Soviet representative, Silin, were charged with the transition government until the arrival of the Bolshevik Revolutionary Committee (Revkom) on December 6. In the wave of repression that followed the establishment of the Soviet regime, Tro and some 1,200 officers of the former Armenian army were exiled to Russia. Tro stayed in Moscow for the next four years. In 1925 he managed to leave for France and then he settled in Romania. He was elected member of the Bureau of the A.R.F. in 1933 and held this position until his death. During World War II, Tro and a small group of A.R.F. members living in the Balkans, cut off from the headquarters of the party in Cairo (Egypt), decided to establish some sort of cooperation with the Nazi German regime in order to save the lives of tens of thousands of Armenian prisoners of the Soviet army and avoid any kind of danger to the Armenian population in occupied Europe. He left his comfortable life in Romania and moved to Germany. When the German army started the organization of the “Eastern Legions,” enrolling Soviet prisoners of war according to their nationality, he encouraged Armenian prisoners to enter military service, because the alternative was death in the camps. An “Armenian Legion” was formed, with some 11,000 soldiers. Tro was also engaged in military counterintelligence missions in Crimea and the Northern Caucasus, but he was never the commander of the Armenian Legion or had any military position, as it has been frequently written. After the war, Tro settled first in the United States and then in Lebanon, while he continued his political activities. He passed away in Boston on March 8, 1956. His remnants were reburied in Armenia, in a section of the memorial complex of the Battle of Bash-Aparan, in 2000. The government of Armenia founded the General Tro National Institute of Strategic Studies, while the Ministry of Defense established a medal in his name to decorate military personnel, freedom-fighters, and civilians who excelled in military teaching. The grave site of General Tro in Boston was visited several years before the transfer of his remains to Armenia. President Levon Ter-Petrossian joined General Tro’s family to pay respects to the hero. 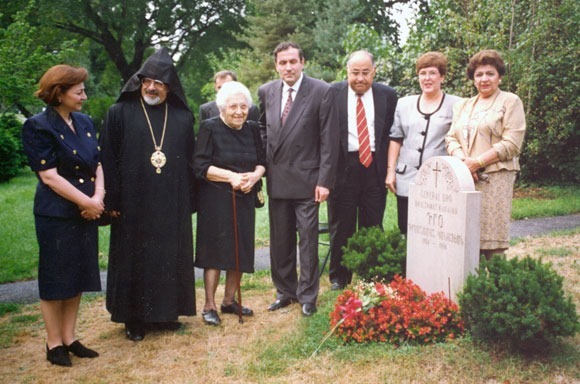 From left: Mrs. Lucia Ter-Petrossian, Archbishop Mesrob Ashjian, Mrs. Kayane Ganayan, Levon Ter-Petrossian, Mr. & Mrs. Mardig Ganayan, and Mrs. Olga Ganayan Proudian [Proodian].